Newcomb is an unincorporated community in Talbot County, Maryland, United States. Newcomb is located along Maryland Route 33 on the south bank of the Miles River southeast of St. Michaels. It is located near a tract of land, which was once owned by Talbot County planter Robert Newcome (d. 1790). ^ "Newcomb". Geographic Names Information System. United States Geological Survey. ^ "Geographic Names Information System". Newcomb (Populated Place). U.S. Geological Survey. 2009-01-29. 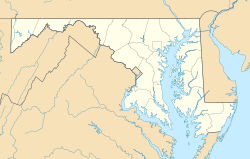 This article about a location in Talbot County, Maryland is a stub. You can help Wikipedia by expanding it. This page was last edited on 16 February 2018, at 13:12 (UTC).